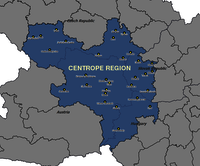 The Centrope region consists of a number of adjacent counties and states along the borders between Austria, the Czech Republic, Hungary, and the Slovak Republic, comprising regions Jihomoravský, Bratislavský, Trnavský, Győr-Moson-Sopron, Burgenland, Lower Austria, and Vienna. It was founded 2003 by the political declaration of Kittsee and aims to strengthen partnership and economy in a region which were suffering from the Iron Curtain during the second half of the 20th century. CentropeMAP is a geoportal connecting the region by collecting web map services from the partner countries. The services are brought together in a single map viewer and allow the user to experience a cross-border working area with dozens of data layers dealing with all topics which could be of interest for regional planners and similar professions. Layers are coming from the fields of biota, boundaries, elevation, imagery/base maps, inland waters, planning/cadastre, structure, and transportation. 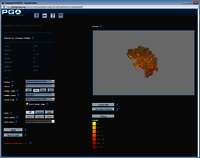 CentropeSTATISTICS is the only available free web tool to visualise cross-border statistical data in its own connected geoportal allowing the user to influence the way of visualisation in multiple ways in the Centrope region. CentropeSTATISTICS can not only create maps, it also serves charts which are interactively created from the data in the cross-border database. For the Czech Republic, CentropeSTATISTICS does not only cover the Centrope county Jihomoravský, but also features data from the counties Vysočina and Jihočesky which are also adjacent or close to the Austrian border. The CentropeMAP newsletter is published twice a year and aims to inform members of state administration and statistical offices about the capabilities of CentropeMAP and CentropeSTATISTICS as well as news from the statistical offices of the partner countries. It also distributes information regarding geodata in the CentropeMAP geoportal.